BILLINGS — The Billings Bench Water Association, which has the right to water in Lake Elmo, plans to drain the reservoir later this week to repair a damaged outlet structure. The irrigation district started draining the lake Wednesday and plans to lower the water level by six or seven feet to expose the outlet structure. The lake will drain for two to four days. Repairs will last a day or two and refilling the lake will take several days. The 64-acre reservoir in Billings Heights is fed by the BBWA canal that runs along the western boundary of Lake Elmo State Park. It drains into irrigation ditches through a headgate next to Lake Elmo Drive on the eastern shore of the lake. The outlet structure was damaged Dec. 6, 2012, when a 22-year-old Billings man drove his 2007 Ford through a fence, over the headgate and 20 feet into the lake. Police charged him with drunken driving and leaving the scene of an accident. Montana Fish, Wildlife and Parks Regional Fisheries Manager Ken Frazer does not expect the lower water levels to harm the lake’s fishery. Fish will move to the deepest portions of the lake – which is about 16 feet deep – as the water recedes, he said. Of bigger concern are native mussels that live in the mud near the shores. In addition to providing a food source for some wildlife, Frazer said, they help keep the lake water clean by filtering it. Mussels are unable to move to deeper water. Lake Elmo State Park, including the dog park, beach, parking lots and playground will remain open to the public, park manager Terri Walters said. However, the section of the hiking trail that is closest to Lake Elmo Drive could close to accommodate construction crews working on the outlet structure. FWP officials anticipate that the lake will refill before the end of next week. 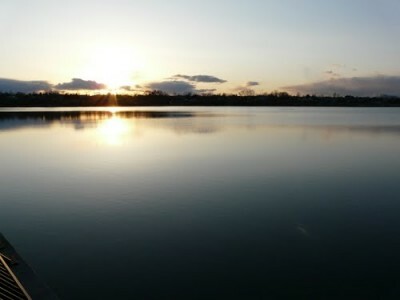 A photo-map of Lake Elmo showing the contour of the reservoir bed is available online at http://www.tinyurl.com/elmobathometric .